This post is sponsored by Vanity Fair® Napkins. A few weeks ago our family was challenged by Jenae at I Can Teach My Child to join the Take Back the Table Challenge sponsored by Vanity Fair® Napkins. We joined in and shared our own Take Back the Table pledge video and challenged my sister to join us! Today we're going to share a little bit more about the Take Back the Table challenge, why we decided to participate, and some tips for how we have made it work for us. WHAT IS THE TAKE BACK THE TABLE CHALLENGE? Vanity Fair® Napkins is on a mission to make families stronger by helping them eat together more often. 1. Pledge to eat at the dinner table more often with your family. 2. Challenge another friend & their family to take the pledge and make the same committment. You can check out our video HERE or just click on the embedded video below. 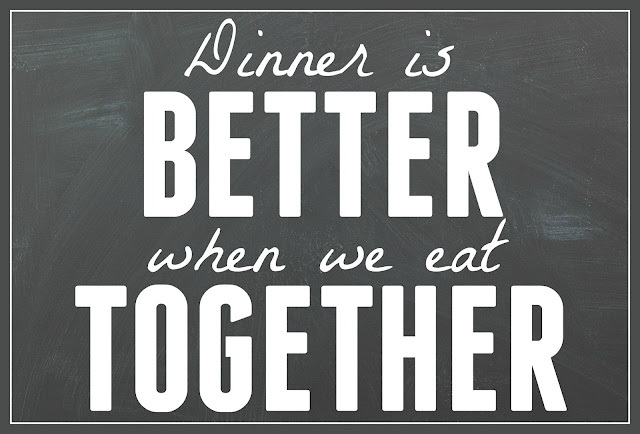 I totally believe that dinner is better when we eat together as a family. Our family is happier too. Research indicates that eating together as a family can decrease stress, improve family relationships, decrease the risk for obesity, and help kids do better in school. In our house we are in better moods and kinder when we eat together. I also just love the time together to connect with my kids and husband, talk about our day, and get to know one another better. Dinnertime is probably one of my favorite parts of the day. Although eating dinner together is important and beneficial, often with our busy schedules it is hard! My husband typically gets home when the kids are getting ready for bed, so having him involved with dinner during the week is tricky sometimes. Over the past month we have tried to all eat together more often during the week. This has required some effort by my husband, but it is always a better night when he manages to get home for dinner! 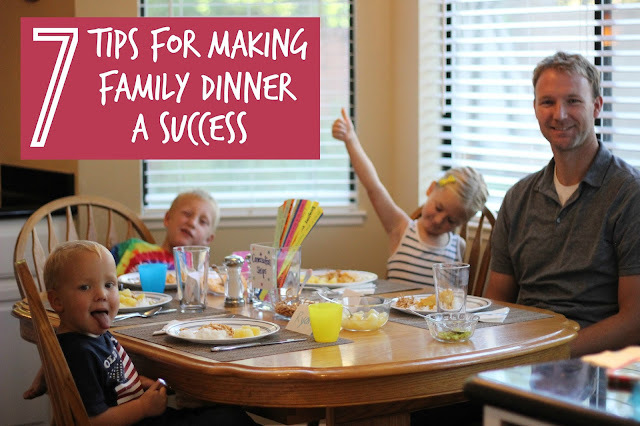 Here are several tips that have helped us be more consistent with having family dinner... and have helped us to have MORE FUN eating together as well! Planning our meals and schedule ahead of time makes it much easier to fit in family dinner time. Keeping a regular dinner time keeps us consistent. Planning out meal options for the week makes dinner time less stressful and more flexible. We make simple meals and we try and schedule very little after 5 PM most weeks. I also try and check in with my husband each week and find a day when he is able to get home early to eat with us. Crockpot meals are my absolute favorite on busy days when we want something yummy that requires little effort. 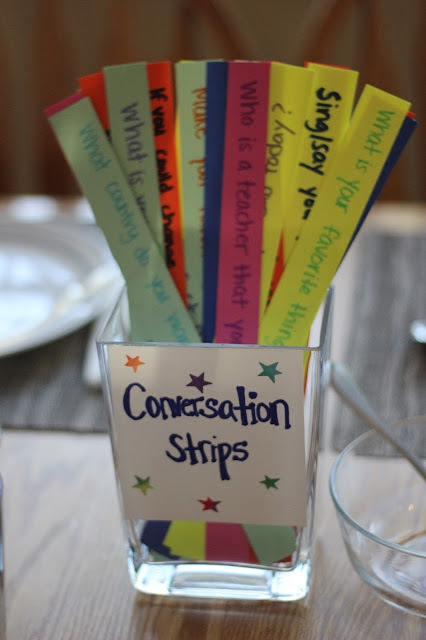 As part of our Take Back the Table pledge we decided to begin using conversation strips during every meal. The questions vary from "What is your favorite treat" to "Who is your favorite teacher and why?" I color coded them a bit so that the orange ones have little drawings on them so that my toddler and preschooler can "read" them without help. If we forget to do questions my kids always make sure to remind me and pull out our conversation strip jar! We try and update the questions from time to time to keep things varied. My favorite questions to ask are, "What is something you learned today?" and "What was the best/worst part of your day?" My kids helped me come up with our conversation strip list but there are also several online resources where you can find some. It is really fun to make homemade placemats for different seasons. 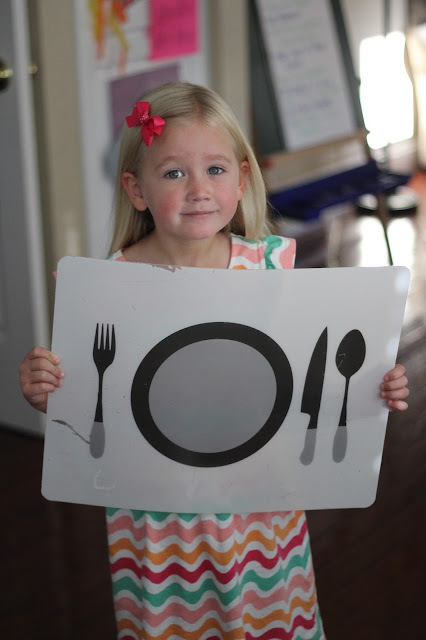 You can even take a favorite sticky wall activity and laminate it and cut it down to a placemat size. We love these place setting placemats we got a few years ago at Target. Our kids get so excited about dinner when they get to help set the table or make the placemats. Dinner time doesn't have to be serious or the same every day. It is fun to have themed dinners based around holidays or special events. We love having breakfast for dinner or a backwards dinner where we eat dessert first. 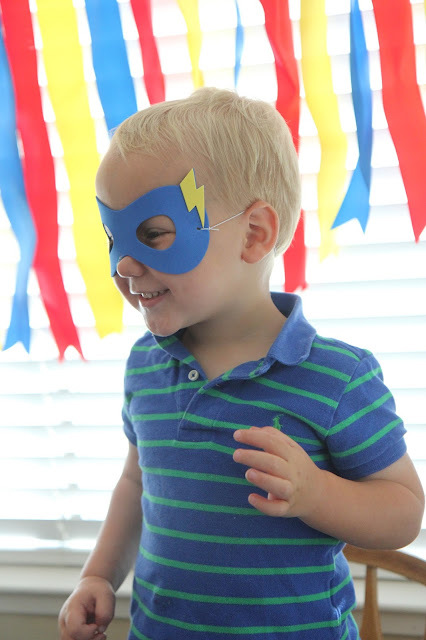 Recently we had a superhero themed meal that was a hit and other ideas could include crazy hat day, eat with a surprise utensil night, or dress like your favorite movie character. Another way that we make dinner a special experience is by adding in a literacy component. We read picture books together or even chapter books sometimes. The kids love to listen and look at the pictures while they eat. Sometimes I will put the kids in charge of dinner. My oldest loves to make pizza bagels so he sometimes helps execute our pizza bagel dinner. Getting the kids involved with selecting the food, helping to prepare it, and then serving it gives them an invested interest in the meal and often gets my kids to eat more than they would've otherwise. Dinner doesn't have to be in the kitchen! Often we will take everyone outside and use a picnic blanket in the backyard. Sometimes if it is rainy we will have a picnic in our garage. Occasionally we'll go out to eat all together as a family and visit a favorite restaurant. How do you make family dinner a success? How often do you eat together? Do you have any favorite tips for making family dinner more fun? Have you taken the Take Back the Table challenge yet?